Catherine Lord won an Associated Board Scholarship at the age of 16 and studied at the Royal College of Music with Hugh Bean and Jaroslav Vanecek. She gave many concerto and recital performances at this time, also winning all the prestigious prizes at the RCM including the Stoutzker Prize and the prize for the most outstanding string player. In 1979 she was awarded six scholarships to study with Ivan Galamian at the Juilliard School in New York. After graduation she worked as a concerto soloist both in Britain and in the USA and after a period as Associate Concertmaster of the New Orleans Symphony Orchestra and Professor of Violin at the University of New Orleans, Catherine returned to London to continue her performing career. She has performed many of the great Violin Concerti with orchestras such as the Royal Philharmonic Orchestra and the Royal Oman Symphony Orchestra and with the eminent conductors: Sir Charles Groves, Norman Del Mar, Richard Hickox and Christopher Adey. Leading American Composer Eric Funk has written a new Violin Concerto for Catherine, and she has recently performed the Sibelius and Szymanowski concertos with orchestra. Catherine is also a founder member of Duo Concertante with double bassist, David Heyes, and the duo has commissioned many new works from several major composers as well as performing across the UK. 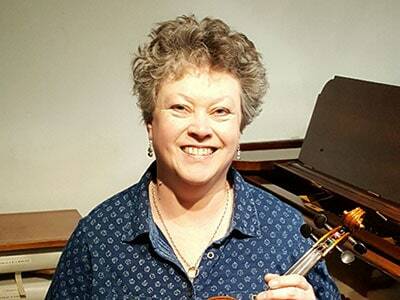 Alongside Chamber Music and Solo Recitals she has taught at the Royal College of Music (JD) and the Guildhall School of Music and is presently Senior Violin Tutor at Wells Cathedral School – one of the four Specialist Music Schools in England. Her students have had great success in winning Competitions and Scholarships throughout the world and many are now professional performers in Europe, Asia and USA.